Imagine for a minute the lifestyle of an olympic athlete. Their athletic lifestyle overlaps in many of their daily activities from what they eat, to what they wear, to how they manage their schedule. What if we looked at prayer not as a one shot daily duty like brushing your teeth, but using the same lens of an athlete. What if we integrate and intertwine prayer into every element of our day? By doing this you would be disciplining yourself in a prayer lifestyle. Prayer as a lifestyle is one that, like every other lifestyle, takes discipline. Whether or not we are aware of it or not, marriage is also a lifestyle. It is a lifestyle that is intertwined in our day as we attempt to keep open communication with our spouse. Maybe it’s a phone call at work to say hi, or making a point to have a meal together, or even going on frequent date nights. Not exactly the way to keep your marriage working. Yet, we do this in our relationship with God all the time when we treat prayer like a duty that needs to be squeezed in at some point in the day. Prayer is just a fancy word for being in communication with God. If He is to be of even higher priority than any other relationships we have, should He not take the majority of our time as well? For many of us, this where that discipline comes into play as we seek to change habits to train ourselves to make speaking and listening to God (AKA-prayer) a lifestyle. Jesus was way ahead of us on our struggles with how to keep open lines of communication with God, so he gave us the Lord’s Prayer. Most of us know it as that thing we mutter at funerals, or perhaps first thing in the morning, or just before bed as a prayer. But have you ever stopped to make sense of what Jesus was showing us? We begin with praise! How easy to incorporate praise throughout our day, especially when we make a point to recognize all the great elements of God’s goodness around us. From the beauty of the morning sunrise, to the fragrance of a fresh rainfall, to the happiness of our kids, or a phone call when we need it. His magnificent hand is on it all! Your kingdom come. Your will be done; on earth as it is in heaven. After praise, we begin with the “listening to God” portion of prayer. Before we speak, we listen. This is a laying down of our own wills and desires and allowing God to interrupt our days. Sometimes, He calls on us to intercede and places a person, place, or moment deeply in our heart to prayer for. This is when we join with him in prayers that He needs (more on this coming soon in a future post). Sometimes, it is that God will place a person in our lives, even if just for a small moment in our day, that He needs to speak life into. Once we lay aside our own will, we are still allowed to come to the throne with our daily requests. In fact, God is our Father, he wants us to come to him with our requests. Daily we are offering forgiveness to those around us. From the person who cuts us off in traffic, to an offending spouse who spoke cruelly, to the past hurts that bubble up. But more importantly, we need to be asking for forgiveness from our Heavenly Father. If you have accepted Jesus died for your sins, you no longer stand condemned, but this does not mean you no longer sin. What it does mean is a heartfelt apology to God washes the smudges of sin once again and then you move on free of guilt. There are temptations in every aspect of daily living, but God promises to always offer a way out, or an escape hatch when the temptation is too strong. Even more, this passage is a call to battle. We are constantly bombarded with pressure from the enemy who always seeking to set up camp in our thoughts. Here we acknowledge we are children of God, and we can call on His name when we need strength. “Holy Spirit come quick,” is often being uttered in my moments of weakness. 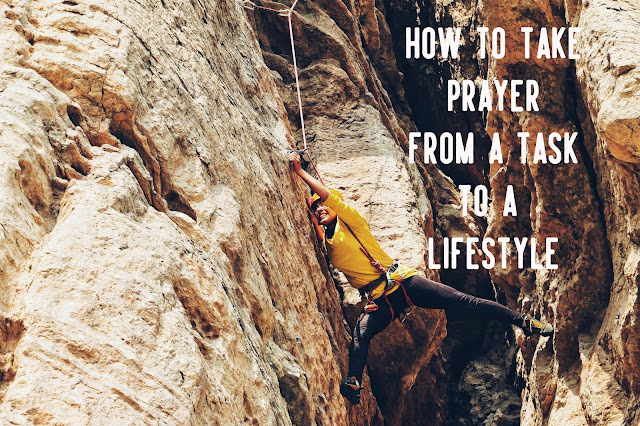 As we train ourselves to use this model of prayer, we can see how we can intertwine these moments into our daily living and be disciplined the prayer lifestyle. We praise, we listen, we petition, we apologize, we wage war, and we find rest in the praise and worship of a good God at the end of it all. Whether you are sitting in prayer for hours (somedays you might! ), or intertwining short effective prayers throughout the day, the goal is to always be communication with our Abba. Listening, speaking, and being in his presence. If you wish to read deeper on using the Lord’s Prayer as a prayer guideline for more effective prayers, you can check out the book Power Praying by David Chotka. Much of what is included in the breakdown of the Lord's Prayer was taught in practice to me by this wonderful pastor/ teacher.